One of the advances in iOS 8 was self-sizing UITableView cells. In earlier versions of iOS, if one wanted a table view whose cells' height varied, one had to explicitly calculate the height for each cell, providing a method which returned it; a process involving considerable string-measuring. Since iOS 8, this is no longer necessary; it is now possible to set a UITableView's rowHeight to a new magic value, UITableViewAutomaticDimension; this causes the table view to evaluate each cell's auto-layout constraints, determining its size. Of course, this means that one has to design one's custom cells in such a way that the constraints “push outwards” on the top and bottom edges of the content view, expanding it as the intrinsic sizes of the contained subviews increase. Still, that makes auto-sizing table view cells a lot simpler, especially for complex cells; in theory, at least. 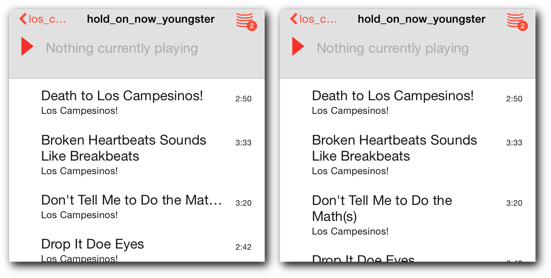 The above view is a UITableView showing the contents of a directory on a music server. The left image is what appears when the user first enters the directory; while the second cell is sized correctly, the third cell is not, and the title is cut off. The right image is what appears if the user scrolls down (moving the top cells off the screen) and then scrolls back up; here, the third cell is sized properly. That's better; the cells that appear at the start are now sized correctly. However, if there are any mis-sized cells below the first screenful, they will still appear incorrectly sized the first time the user scrolls to them. Which means that we need something subtler than reloading the whole table view at start time. Fortunately for us, the UITableViewDelegate protocol has an optional method titled tableView:willDisplayCell:forRowAtIndexPath:. As the name suggests, if defined, this is called just before a cell is displayed. Which would allow us to force a reload of the cell. This will cause each cell to be reloaded only once. Of course, this is just a beginning; if the user scrolls down rapidly, it will still trigger a flurry of reloads. The next step would involve application-specific logic, checking whether a cell can be eliminated as a candidate for reloading based on model information (for example, is it a type of cell which suffers from the problem, or is the information in the model particularly long).